Us penetration testers have of course all heard of BackTrack it’s the most popular penetration testing distro out there but Node Zero is a great alternative. 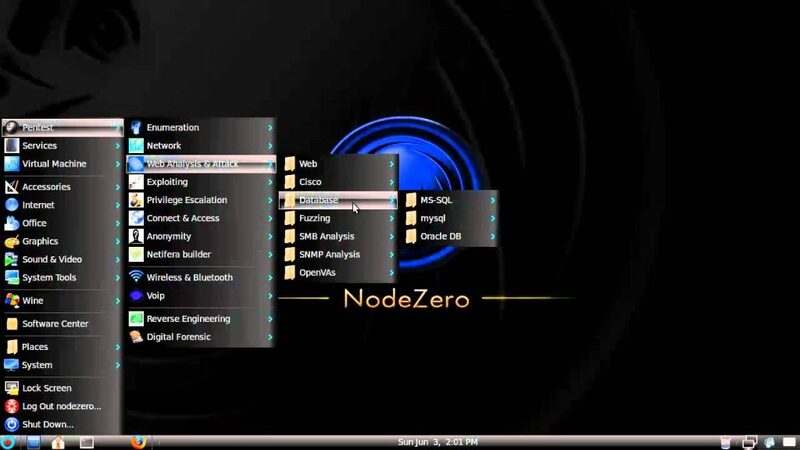 Node Zero was formally known as Ubuntu Pentest Edition and was the first Ubuntu/Gnome based pentesting distro out.
. NodeZero uses Ubuntu repositories so your system will be always up to date. With NodeZero comes around 300 tools for penetration testing and set of basic services which are needed in penetration testing. For a complete list of tools you can visit http://netinfinity.org/tools/ or for more info on Node Zero itself visit http://netinfinity.org/ Node Zero can be ran live from CD or USB or easily installed for better performance. This distro will be seeing great improvements in the next upcoming version and has great performance for low capability machines. The best thing about this distro is it has hardly any setup involved “It just works!” And the distro is based on Ubuntu 10.04 which is a LTS (long term support) distro this is a very great thing since from time to time everyone needs some sort of support this ensures that support will be offered as long as you don’t upgrade the distro. I’d love to hear what others think about the use of this distro. Please feel free to share your experiences with me or on the Node Zero website in the forums 🙂 Also added blue-tooth support will be coming up including easy setup for your ubertooth one! ← Hacknet , a real Hacking game.